15 oz. Large "El Grande" Logo Imprinted Ceramic Mugs. These 15 oz. Large El Grande customized coffee mugs have a classic, yet chic mug design. They have a smooth molded ceramic composite and a glossy colored exterior with matching colored interior. These promotional mugs come with a c-curved handle for an easy comfort grip. 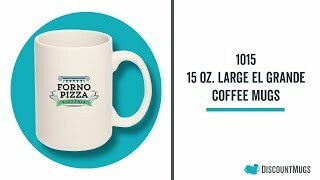 We offer these mugs in unique colors such as almond, black, cobalt blue, green, maroon and white. You can order these in bulk for coffee shops, stores, hotels, resorts, restaurants, diners, personal gifts or promotional giveaways. Get them imprinted with logos, slogans, graphic designs or your choice of text. You can easily personalize our 15 oz coffee mugs using our online tools and D-Lab system. Choose the logo, text or artwork you want to use and upload them onto our design lab. If you’re getting them printed, choose the imprint color you want for your font and graphics. You are free to request an artwork proof to make sure they will look the way you want them to. Order today with us and you will get 110% price match guarantee on your new promotional coffee mugs. We used this large black mug with our logo as a customer appreciation give-away for our patients. It's the "Patient of the Day" gift. So each patient who receives it gets a clear bag wrapped around the mug and a package of hot chocolate and a package of coffee. You would be surprised how much our patients appreciate this small gift! It has been a great relationship builder and we post a photo of the patient holding the mug on our Facebook each day. We ordered 144 the first time and I am re-ordering the same mug today. We will definitely keep using this product for our Patient of the Day gift until we have exhausted all of our patients and will then switch to another item. Thanks so much!! Iâ€™m very pleased with the quality of these mugs. The whole process was easy including the service rep who helped align the artwork through chat. I ordered 72 mugs and they arrived within just a few days and look extremely professional. Will definitely order again. The mugs were great and we received them well before the projected delivery date. We will definitely order again in the future!